Can be customized in your colors. Beautiful Modern twist to this pattern. I followed no pattern, I just went with what I felt looked good. ( like a lot of my quilts) I have done this one 2 different ways, photos shown are of a king quilts, this listing is for the smaller sizes/ pictures are used for example of other color ways. 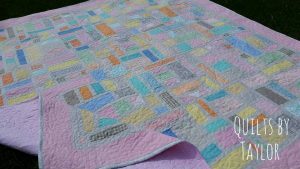 I base my quilts Not Just by SIZE, but by SKILL LEVEL, all quilts are different, and although they may be the same size, some are simply just more work. Or some I hand dye all the fabrics myself. Im not afraid of big quilts, I have offered some of my quilts even in California King Sizing.